I always found the word “relaxing” quite confusing. What might seem like relaxing to me would often end up as “wasting time” for others. In my opinion, the word “Relax” is quite subjective. Everyone has their own ways to relax. I have captured the state of relaxing in the following six pictures. This priest was relaxing & listening to the devotional songs on his iPod at the Galtaji Temple near Jaipur. The stick near his feet is to ward off the monkeys teeming all around in this complex. Even though the foreigners popularly call this temple complex as the Monkey Temple, Galtaji Temple administration is not very happy with this reference. It’s an important temple of Ramanandi sect of Vaishnav Hindus. Friends relaxing in the perfect weather at one of the many Ghats on the Pushkar Lake in the holy town of Pushkar, Rajasthan. It’s difficult to enjoy such a calm & serene view during the famous Pushkar Fair. The old woman in this picture was relaxing and enjoying the warm sunlight on a cold morning in Pushkar at Old Rangji Temple. Even though the new Rangji temple is massive & attracts many people, it’s difficult to forget the former for its architecture, workmanship, following among the devotees and heritage. Relaxing with a great view of the Amber and Jaigarh fort in the Amer town. 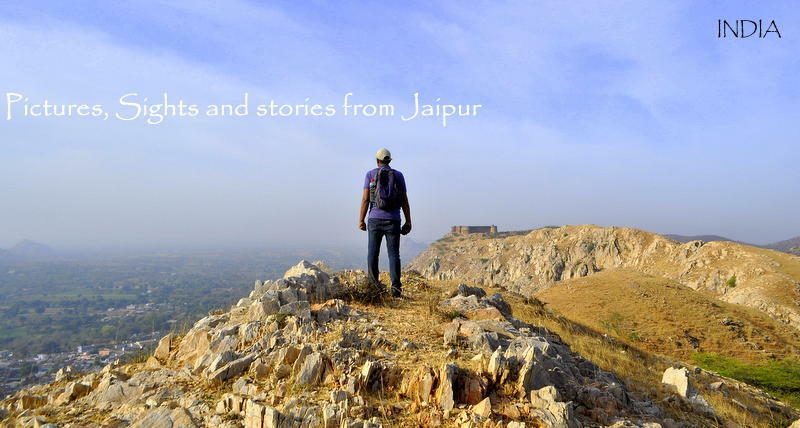 If your idea of relaxing is to sit back and enjoy the great views, then I’m sure you’ll love this place which affords a panoramic view of Amer & Jaigarh Fort. There’s always a mad rush at the Jaipur Literature Festival; too many things happening at the same time – sessions taking place in 5-6 venues, simultaneously. Diggi Palace, the venue of JLF appears cramped, with visitors teeming all around. Despite all this, a couple finds space and time to relax in the warm January Sun! Basking in the Sun! I shot the above picture at the Johari Bazaar during winters. The street dog surely has some choice! What’s your idea of relaxing? This post is inspired by Relax- Weekly Photo Challenge. Some wonderful choices here Arv, but I must admit my favorite is the shot with the dog on the car. How often does one get to see THAT?! I’m happy you liked them Tina. Love the last shot of the dog on the car! 🙂 That’s definitely my idea of relaxing. 🙂 How’s Jaipur Literature Festival this year? Yet to unfold a month later. It’s more of lifestyle show than jlf! More celebrities than authors. More of hangout place than lit fest. It’s like a fashion parade! They all make it so cramped. Serious re-jig required from the organizers! I guess that’s a common choice! We humans have far too many things on our mind, to relax! Great photographs! Sitting back and letting go is always a nice way to relax. You are absolutely right. Relaxation has different meaning for different people. I loved the last pic 🙂 Also, thanks for stopping by at my blog and liking my posts. Appreciate it ! Pingback: Reflections/ My Favorite Pictures on Jaipurthrumylens in 2016 – Jaipur thru my lens ! !